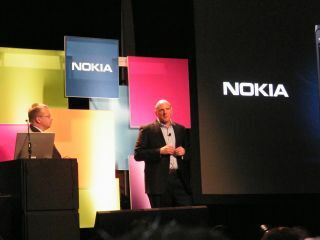 Nokia will use its appearance at MWC 2012 to launch at least one high-end mobile phone according to an industry source. Speaking to Forbes the source revealed the news but did not provide any further information – leaving us musing on what Nokia may have up its sleeve. Nokia's press conference at MWC 2012 is expected to shed light on the Finn's strategy for the year and its upcoming handset range – expected to include new Windows Phone devices. Rumours previously suggested the new high-end handset Nokia is set to reveal would be the Lumia 910, but this has been refuted by Nokia's head of Imaging Experience Damian Dinning who stated that no such device exists. There has been no confirmation whether the new top-end handset will be running Windows Phone. It could potentially run Symbian Belle, the latest version of Nokia's own operating system which has recently been rolled out. Although we would question Nokia's plans if it launched a flagship device running an operating system which it has publicly declared it is winding up. The Nokia MWC 2012 press conference will take place in the morning on Monday 27 February and we will be in Barcelona to bring you the news live.